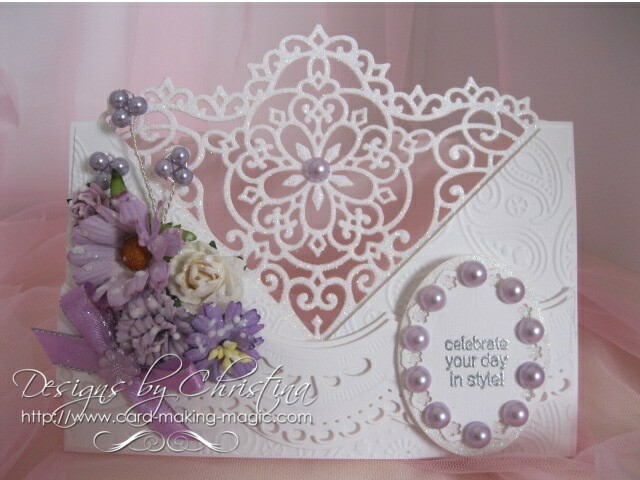 The beautiful Decorative Blossom Corner is another die from Spellbinders and it can help you to create a really stunning card that will certainly get the comments from people who see it. It looks intricate but I promise you it is easy to do ... it just needs a little measuring and patience and you will have a card that you can be really proud to give. I created this card for a Wedding and added in the colors to suit the wedding theme. You could make it for any occasion that you can think of. Make it in gold, red, or silver for one of the special anniversaries that are celebrated. Add a number to it for those milestone birthdays that are so important. In fact any reason would be perfect for this really beautiful card. And don't tell me you can't make something this intricate ... because I don't believe you. YOU can do anything you want too and the video will take you by the hand and show you what to do. And I don't want to hear "It wouldn't be as nice as yours ...." either because it will. 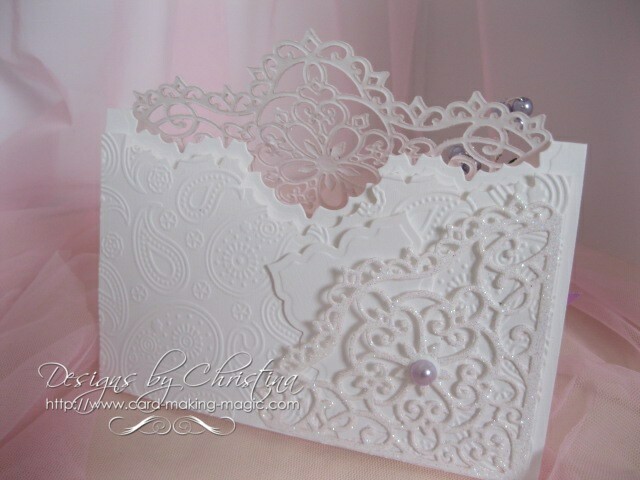 Because of the style of this card you will need to pay some attention to the back and make it just as pretty as the front. I have added in a pocket to the back and it just fits a small tag that can be used to add a signature or greeting with out spoiling the main card. The glitter that I have used is from Glitter Magic and it comes in many colours so you could ring the changes by simply using another colour glitter. So please give this a shot and let me know how you get on with it. Then add your photos to the Gallery Page .... you do take photos of the cards you make ??? Yes ??? NO !!! You don't ... well shame on you ... you should and that way you can see what you have made, what you like, what you don't like and how you have improved.